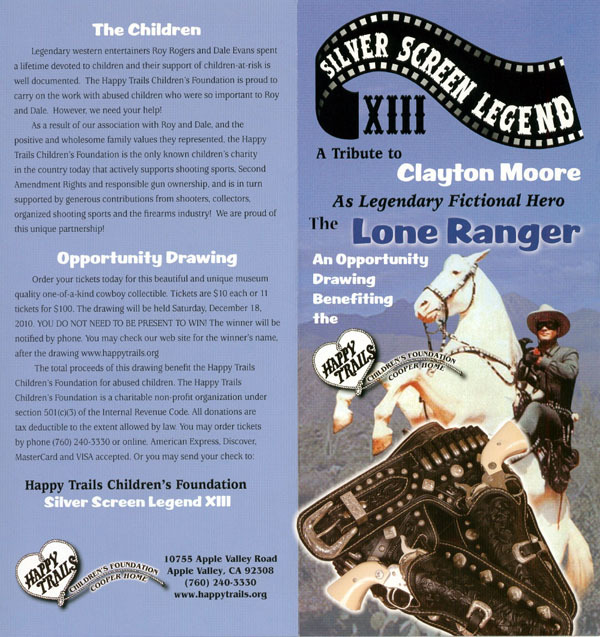 Tribute to Clayton Moore by the Happy Trails Children's Foundation! by the Happy Trails Children's Foundation! On December 18, 2010, in Apple Valley, California, a drawing will be conducted by the Happy Trails Children's Foundation. The prize that will be given to the winner is a tribute to Clayton Moore and his career of portraying The Lone Ranger on television and on the big screen. The one of of a kind collectible prize includes a replication of a special double gunrig that Clayton originally had designed for him by Ed Bohlin. The replicated gunrig is handmade and wil include "silver bullets", sterling silver conchas, buckles, etc. It is gorgeous! 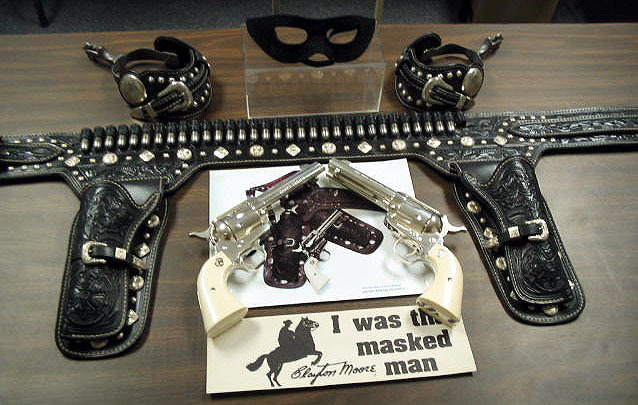 Also included will be a matched pair of silver plated Colt Single Action Army .45 caliber revolvers. The guns will have hand-carved pre-ban ivory grips and have consecutive serial numbers. Also included will be a set of spurs and spur straps with their own interesting creation history. and was used only for the photo. Photo COPYRIGHT © 2010 & courtesy of Jim Hollaert. Proceeds from the drawing will benefit the Happy Trails Children's Foundation for abused children. 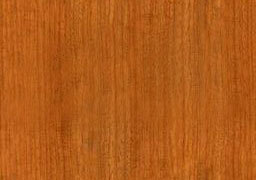 This foundation is a charitable non-profit organization under section 501(c)(3) of the Internal Revenue Code.